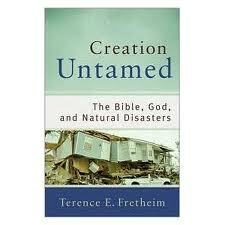 The issue of God and natural disasters is one that has perplexed the most inquiring of minds for thousands of years. It has led many to faith and many away from faith. In the end there is mystery and we can never fully fathom the ways of God. What we can do though is trust, and, like Peter, when asked by our Lord if he wanted to join those who were leaving Jesus, responded, “to whom else would we go; you have the words of eternal life.” Fretheim’s book encourages us to trust in a God who is good, despite what we see around us, despite the indescribable pain of those in the midst of suffering. His explanations are biblical, well thought through and compassionate. I recommend this book to anyone seeking to understand how it is that we can worship a God of love in a world where disasters fall indiscriminately on the just and the unjust.